A tradesman delivering goods with a yoke near Broadway, Worcestershire, at the turn of the century. Source: The Book of the British Countryside (published by Drive Publications Limited, 1973), which contains the picture of the man wearing the yoke, contains a number of illustrations that show farming practices over the ages. The illustrations do show that the heavy and dangerous work was always done by men. 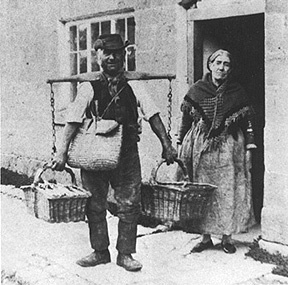 At the resolution provided by this copy of the picture in this document, the detail is insufficient to show that the woman, who may have been either one of the tradesman's customers or his wife seeing him off on his daily rounds, is wearing polished dress shoes and has no fallen arches. The man on the other hand is wearing dirty, worn shoes that are not polished, and he quite obviously has fallen arches. Although he is wearing a smile and the woman is not, he must have found his delivery route to be tiring and painful. Carrying the load under his yoke is certainly not an exercise that elevates him to the status of oppressor and an imposing figure in the "patriarchy." Why was he smiling and the woman wasn't? Isn't it good that men managed to make things a bit easier for themselves by inventing vehicles and tools through which their burden could be lightened a bit? Isn't it also good that they invented production methods that allow them now to produce these vehicles at a cost that people can afford? We should give our gratitude to all men who selflessly and wearing smiles devoted their lives throughout history to improve the lot of all of society. Why is it that radical feminists can't find it in their hearts to do that? Maybe they are aliens from a different planet, as James Gunn, tongue in cheek, suggests in one of his pieces, The Misogynist. In 1961 to 1962 I worked in Korea as an advisor to the Korean Ministry of Communications, under contract by Siemens & Halske, a German telecommunication equipment manufacturer. During that time I had an opportunity to observe Koreans of both sexes in the performance of their duties. Yes, it was a patriarchal society and as related in a message by Prof. Mark Patton, who works there right now, to a large extent it still is. The Korean economy was coming out of the ruins of the Korean War. Not only that, it was also just setting its foot into the industrial era during which it became the industrial giant it is now. The heavy work was done by men, not by women, although women took part in many of the lighter tasks of agricultural work. I took many photographs of people at work. It fascinated me to observe men carry their loads, not women (women never did heavy work). There were few carts and far fewer motorized vehicles in use in Korea at the time. I never even saw a wheel barrow while I was in Korea, but there was a considerable number of bicycles. Loads were carried on the luggage racks of bicycles by those people who could afford the latter. Those people who couldn't afford bicycles carried the loads on their backs. It was always men who carried them, everything and anything, from pigs (who were first given rice wine to drink to make them docile) to market, to concrete up the scaffolds at construction sites. The men who were load carriers moved enormous weights. The base of their equipment they used to carry it with was an A-frame with shoulder straps that often were fashioned out of plaited straw. The A-frame was constructed out of a pair of tree branches that had a smaller branch branching off horizontally toward the back. Those smaller branches were the base for a platform on which the load to be carried was arranged. Some of those loads must have weighed far more than a hundred pounds. The carriers would position their carrying rack on the ground, with the A-frame and a removable balancing stick forming a stable tripod. They would stack their loads and then slip into the harness. After that, they would slowly stagger upright and carry their load to the destination that it took often many hours of walking to reach. Seoul, the capital of Korea, had in those days (in 1961) few sewers in older residential areas. Besides, the back alleys of those residential areas were far too narrow to permit the passage of any motor vehicles, especially not vacuum trucks. I saw men (never women) with yokes like that shown at the top of this page, with a pail on each end, carry the night soil out of those alleys and empty their pails into larger vats mounted on ox-carts that were waiting at their alleys' ends. The photo of Shorpy (at right) shows Shorpy to be covered with grease. It does not stretch anyone's imagination too far to figure out what the night-soil carriers in Seoul were covered with. 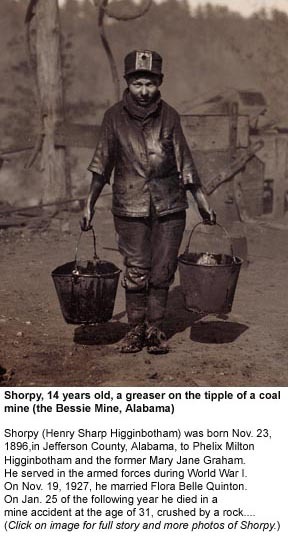 Those men were quite literally at the dirty end of the job of living and of being providers for their families. In other countries that I passed through on the return trip, rickshaws or tricycles were used for transportation. Those were also pulled or propelled exclusively by men. As I saw those men labouring to move loads within their local economies, I gained one firm impression. In addition to being providers and protectors, men in patriarchies always and everywhere in the world were and still are beasts of burden. There were and are exceptions in some countries and societies, but it seems that those countries and societies do not amount to very much. It seems that where men weren't carrying their load, the economies never evolved far. Some of those economies never made it out of the stone age. As I observed the Korean men carry their loads, I knew that their country's economy was destined to develop into a world power. The rest is history. The men who carried and still carry their loads in "patriarchal" societies, and who often sacrificed and still sacrifice their lives and health in the process of bringing their societies to greatness, deserve our gratitude. It is comforting to know that there are still whole societies, largely untouched by the ravages of radical feminism *, who recognize the sacrifices that men make. As Prof. Mark Patton tells us in his message from Taegu in Korea, South Korea is one of those societies. The French language still recognizes to this day the role that men played in doing the important job of moving the goods. The term for truck driver is le camion  the carrier (masculine). Carey Roberts is an analyst and commentator on political correctness. His best-known work is an exposé on Marxism and the roots of radical feminism. 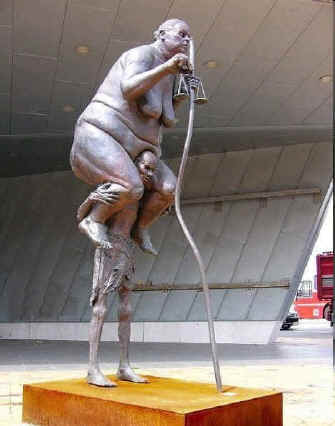 Men As Beasts of Burden, by Marty Nemko, career coach to 1,500 middle and upper class women and to 500 middle-to-upper class men over an interval of 17 years: "There are five widows for every widower...."